If you’re on the lookout for the best octave pedal available on the market yet the time you have at your disposal is limited, this post might be of assistance. After examining the value and specs of some of the most appreciated products in the line, we have concluded that the Electro Harmonix Micro POG is the first option to consider. This product was designed to make your guitar sing like a 12-string or turn it into a bass. It features various controls that ensure ease of use and versatility and it comes with a solid body. In case this item is sold out, you might want to consider the Boss OC-3. The great variety of octave pedals for sale might turn your shopping into a challenging task. To simplify your decision-making process, we have compiled a list of octave pedals reviews based on the products that received the highest ratings and the specs a good octave pedal should feature. Committed to delivering smooth polyphony and perfect tracking, the Micro POG from Electro-Harmonix is the first model you should consider. Featuring a simple yet solid build, the octave pedal was designed to make your guitar sing like a 12-string doing a great job with a bass, too. The Dry, Sub Octave, and Octave Up Controls the unit boasts will help you customize your sonic experience, explore, and practice. You can thus use the Octave Up knob to dial in one octave up, the Sub Octave knob to add a lower octave, and the Dry knob to blend in the desired amount of effect. The materials used and the design of the pedal render it pedalboard-friendly. The compact and tough die-cast chassis was built to keep up with your gigs. It is an accessory you can easily add to your pedalboard and musical gear as it measures 8 x 3.5 x 7 inches. Another option to consider when looking for an octave pedal for acoustic guitars is the OC-3 from Boss. You won’t just get a pedal that will help you flavor your gigs and enjoy true polyphonic octave effects but also a compact build that will make it easy for you to add it to your pedalboard. What’s nice about this unit is that it works great with a bass, too. You can easily consider it as a reliable option when looking for bass pedals. That’s why it features separate inputs for both guitar and bass. The unit allows the player to use the Drive mode when a more aggressive tone is desired. This model also comes with the original OC-2 mode and the Poly Octave effect you can adjust to enjoy and create sounds within a specific note range. The product measures only 8 x 10 x 8 inches and weighs 1.1 pounds. Transposing your guitar’s pitch over a +/- three-octave range and boasting three modes that will allow the pitch to be transposed up, down or both ways at the same time, the Pitch Fork from Electro-Harmonix is a pedal you might want to check before making your decision. This model won’t just let you experiment more but will enable you to do that through a user-friendly design that makes the entire experience enjoyable and easy. The product features straightforward and intuitive controls. You can use the Blend knob to mix between the analog dry signal and the effected signal. Also, you can select the maximum interval of chromatic transposition with the 11-position Shift switch whereas the MODE toggle switch will help you select whether the pitch shifts down, up, or both at the same time. The unit comes with an EHX 9.6DC-200 mA power supply but you can also use a 9-Volt battery to run it. 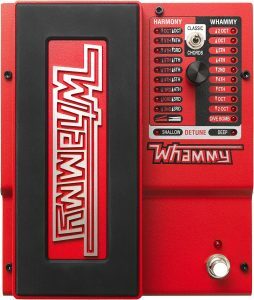 Enriching your guitar experience and getting you a greater diversity when playing are the things DigiTech had in mind when creating the Whammy pedal. This pitch-shifting pedal won’t just provide you with the classic Whammy sound but also with chordal pitch-shifting and true bypass. Designed to bring depth to your music and enhance it, this model can help you turn your solo gig into rebellious tones or create chordal bends to tame your audience. The pedal will make sure you preserve your tone at all times thanks to the true bypass switching. The increased functionality of this model will elevate your sound and flavor your music. Boasting MIDI compatibility for ease of use, the Whammy pedal can be connected to any device so you can send and receive pitch-bend information and control it. You can thus control the pedal from your keyboard, a MIDI foot controller or any other MIDI device you want to use. If you’re interested in enhancing your music experience but also in great portability, this model from TC Electronic might be just what you need. The pocket-sized pitch-shifting Sub ’N’ Up Mini Octave boasts the same octave-engine its bigger brother features, the difference between the two models residing in the product dimensions. Measuring only 3.8 x 2.4 x 2.2 inches and weighing 6.7 ounces, this unit can easily be added to your guitar accessory collection even when on the road or having street gigs. Committed to delivering perfect accuracy and flawless polyphonic tracking, the Sub ‘N’ Up octave pedal fits on any pedalboard. The product comes with the TonePrint technology that will enable you to load your favorite TonePrint and find the sound that best suits your preferences. You get controls for Sub, Up, and Dry for greater versatility when playing and a simplistic design that ensures ease of use. In case you’re interested in a classic analog octave up effect, the Tentacle pedal from EarthQuaker Devices is an option you might want to check before you reach a decision. The product won’t just help you add a swelling octave to anything you want to play but will enable you to do so in the most simplistic way. Featuring no controls, the Tentacle comes with a switch button you will have to hit in order to enjoy the effect. You just have to hold the flexi switch for momentary operation or tap it to toggle on/off. The item is committed to creating impressive effects when played above the 12th fret. If you want to get outstanding results, you can simply stick it in a delay effects loop. In case you’re interested in a more pronounced octave, you should place it as close to the front of the chain as possible. Designed to meet the needs and preferences of different guitar players, the JF-12 from Joyo offers various options to work with and use to enjoy a varied sound experience. Boasting both distortion and octave guitar effects, this model is worth considering if you want to create an octave up sound or get a distortion sound. You can use the standard Fuzz distortion to add layers of harmonics and meet the sonic adventures of country and jazz genres. The other option, the octave effect, can be used independently of the distortion feature to create cool sound effects. The mid-cut switch will allow you to control the tone. The options offered by this model make it perfect for blues, rock, jazz, funk, fusion, and country guitar players. The aluminum alloy casing sports a varnish finish, measures 4.7 x 3.8 x 2.2 inches, and weighs 13.8 ounces. Another option to keep in mind when looking for an octave pedal to modify your sound and translate your creativity into unique sonic experiences is the M288 model from MXR. Offering analog tones with true bypass, the dual-voice octave pedal was designed to flavor your music through a simplistic yet sturdy body. The unit features a Dry knob that will allow you to mix your direct bass signal with the octave effect. The other two knobs, Growl and Girth, will provide the players with the possibility to add midrange or low end to their sounds. The Growl knob will get you a throaty tone enhancing the sound definition and realism whereas the Girth knob creates a deep tone. Superior tracking and high headroom are ensured by the 18-volt Constant Headroom Technology featured. The Mid+ switch enables the player to add up to +14dB of internally adjustable mid frequencies. In order to get the best out of your guitar, there are various accessories you need to use such as a quality guitar tuner to make sure you don’t go out of tune, an overdrive pedal to enrich your sound and add your unique touch to your gigs, or professional guitar amps to go from the home practice sound to that stage effect. Just like when you’re looking for an overdrive pedal to explore the many possibilities sound experiences offer, there are various features you need to keep in mind to make sure you get the right octave pedal for your needs. Even if your budget limits you to go for cheap octave pedals, the factors to consider are the same. What are octave pedals made for? The first thing to do before getting such a pedal is to understand what it does and how it helps your music. What octave pedals do is take the note you’re playing and shift it by exactly 12 notes up or down. For instance, if you’re playing a C note and use an octave pedal, you will still hear a C but it will be an octave lower or higher than what you played. There are octave pedal models that can shift by more than one octave (12 notes). 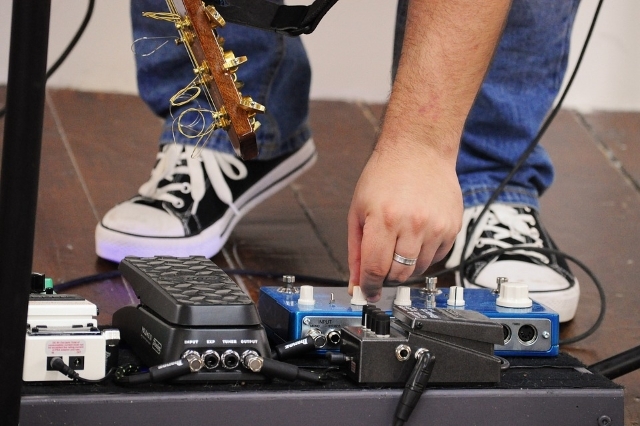 You will find pedals that can shift by 2 octaves (24 notes) or 3 octaves (36 notes). Using such models will help you enjoy really unique sounds and even layer multiple octaves for an organ-like effect. Choosing the best octave pedal for your needs means getting a pedal that will be able to accurately detect your signal. This means you need to consider tracking when buying a new octave pedal. You will find digital and analog tracking. Older octave pedals usually use analog tracking to adjust the amplitude, frequency, and filtering of the signal. They will generally get you raw and fuzzy sounds that can have a bit of a warbling touch. This occurs when the analog pedal can’t track the signal properly. Most modern octave effects, though, offer digital tracking which comes with a greater accuracy. Given its flexibility, it can be applied to a great variety of sounds. As far as the warbling sound is concerned, such effects are less common with digital pedals. Tracking is not only divided into the two categories mentioned above. You will find pedals that offer monophonic or polyphonic tracking and this is another feature you might want to consider when choosing the model that meets your needs best. A pedal that is polyphonic will detect and shift accurately anything you play, chords included. Analog pedals are usually monophonic, which is why they have trouble tracking. They get confused when they detect an accidental open string or an overtone. Digital effects can be either of the two, so it is up to you whether you go monophonic or polyphonic. You will see that some octave pedals can be manipulated with the help of an expression pedal. Some models are designed in such a way to allow the player to attach a generic expression pedal whereas others come with one built-in. If you want to add a new dimension to your practice and gigs, you might want to consider a product that comes with a generic expression pedal. Such products will enable the player to adjust the blend of the effect, create unique effects, and glide to a different note. Each octave pedal available on the market features a unique character based on its tracking, design, and circuitry. Some pedals offer even additional controls so you can enjoy a greater versatility and freedom when playing. Such a control is the Gain/OD option that allows the player to dial in additional distortion or gain. If you want to give your octave effect extra resonance, you might want to go for a model that comes with the Filter control because this will allow you to round off certain frequencies in order to create a lo-fi sound. If you use various pedals or tuners to play, you should also keep in mind that octave pedals are most often placed at the front of the chain with a clean signal going into it. They are placed after tuners and volume pedals. In case you have a different order on your chain, consider that the octave pedal you’re seeking should have priority. By placing your pedal at the front of the chain, the cleanest input signal is ensured and the note you’re playing will be easily and accurately tracked. However, if you want to create a warp, abrasive sound, you can place the octave pedal after a fuzz pedal. Different octave pedals come with different controls. There are some controls you should not be flexible on, though. You need a pedal that allows you to adjust the strength of the octaves and that comes with separate controls for the octave up/octave down options. This way you get greater flexibility. You might want to consider a pedal that lets you choose how far the pitch is shifted and get one that features multiple pitch intervals. In case you’re interested in other types of pedals to enhance your experience and get more creative, you might want to check our post on how to choose a delay pedal to help you meet your needs.